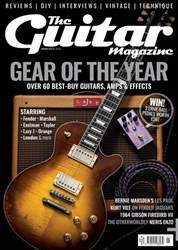 Dear TGM, I’m totally in accord with Huw Price in the December issue, with his assessment of the Mary Kaye model as the most desirable Strat. For a while, my ultimate piece of Fender eye-candy was the all-gold, 1950s Homer Haynes model, which the Custom Shop recreated in 1989. A bit beyond my financial reach at the time, but salvation came when the company produced a very close, Mexican-made replica of that instrument to mark its 50th Anniversary in 2004. I bought one like a shot and still have it. Then the Mary Kaye came to my attention. How I’d missed it before, I just don’t know, but I was hooked. Trouble was, when a very similar guitar was reissued in 1987, it didn’t even register on my radar – to this day, I don’t recall seeing one come up for sale and a Custom Shop order is still beyond my means. It looked like that situation was something I was going to have to live with until about five years ago, when I saw a Tokai Japan instrument that’s that seemed to tick all the Mary Kaye boxes, but was affordable to me. I really don’t fret (ouch!) too much about it not having Fender on the headstock! TGM There’s something about the Mary Kaye Strat that’s captured many players’ imaginations. For a pretty affordable option with ‘Fender’ on the headstock, try to track down a 60th Anniversary Classic Player ‘50s Stratocaster from 2014. Its Desert Sand finish isn’t a million miles from aged blonde, it has gold hardware and a maple neck, and you could swap the gold pickguard for a white one. Either way, enjoy your Overdrive Strap!